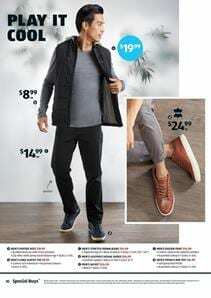 ALDI Catalogue offers a variety of travel supplies. If you have plans to go somewhere but unsure about the equipment you have, why not take a look at this range? 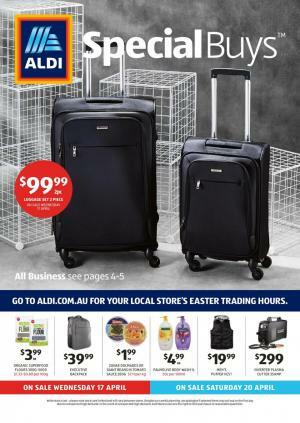 ALDI Catalogue Special Buys Week 16 are luggage sets, power banks, briefcases, and similar sort of quality products to company your trip. These seem to be pretty useful especially in a business trip. Most things are either black or grey in this catalogue's travel supplies sale. In holidays, you might wanna go somewhere but you can also bring that place in your home. For example, Greece! Surely, it's an authentical place and an enjoyable one but the food is delicious too. Greek foods like Greek olives, cheese stuffed peppers, vegetables, baklava, and more are in this range. We actually don't have to call it Greek food. It's basically Mediterranean food that is abundant in countries like Egypt, Turkey, Syria, Israel, even Italy and France. If you are trying to keep it fit and healthier, buy some healthy foods at ALDI on 17 April. See more deals on personal care, clothing, power tools, hardware, Easter treats on the catalogue. These will be available on Saturday next week. Subscribe to the newsletter for emails about the future ALDI Catalogues. Saturday deals of ALDI Catalogue are kids' art products, stationery, books, bath products, bath toys, and home appliances including washing machine. Buy adjustable craft play table for only $69.99 at ALDI stores on Saturday. Crafting tools are interesting products for kids. Their development of creative intelligent might depend on the environment they grow up. Buy drawing accessories at $3.49 which is a nice price at ALDI Store. ALDI offers bathroom products for kids. Bath towel, hairbrush, bath robe, step stool, and more products are available in this selection. Also, kids can entertain bathing with products like children's licensed bath sponges. Pay only $2.49 for that product. Visit pg 14-15 to explore the price range of home appliances like steamers, washing machine etc. Improve the technology of your home to achieve an easier and more convenient way of doing the laundries. Check out these products and prices from the latest ALDI Catalogue which is the special buys week 15.